The MET Breuer is currently presenting a solo exhibition of the work of Julio Le Parc. Focusing predominantly on his work made around the year 1959, just at the time the Argentinian artist moved to Paris. Much of the work on display involves the use of sequences of geometric figures to create a sense of movement through space. In “Rotation of Fractioned Circles” each of the unevenly divided circles remain the same. It the position of the dividing chord within each circle that changes as the circle rotates 10 degrees around it center point. The progression follows left to right then down to the next line then left to right again. “Metamorphosis of a Line” is a series of nine panels beginning on the left with a horizontal line segment. This line segment seems to fold open becoming a rhombus with obtuse angles at the top and bottom vertices. These angles become smaller. On the fifth panel all vertices are 90 degree angles forming a square. The angles of the top and bottom vertices continue to decrease. The angles of the side vertices of become obtuse until the rhombus folds inward leaving a vertical line segment. Le Parc’s elegant and precise gouaches illustrate geometric forms changing and moving through a series of consecutive images. These works are the precursor to his later Kinetic art in the 1960’s. 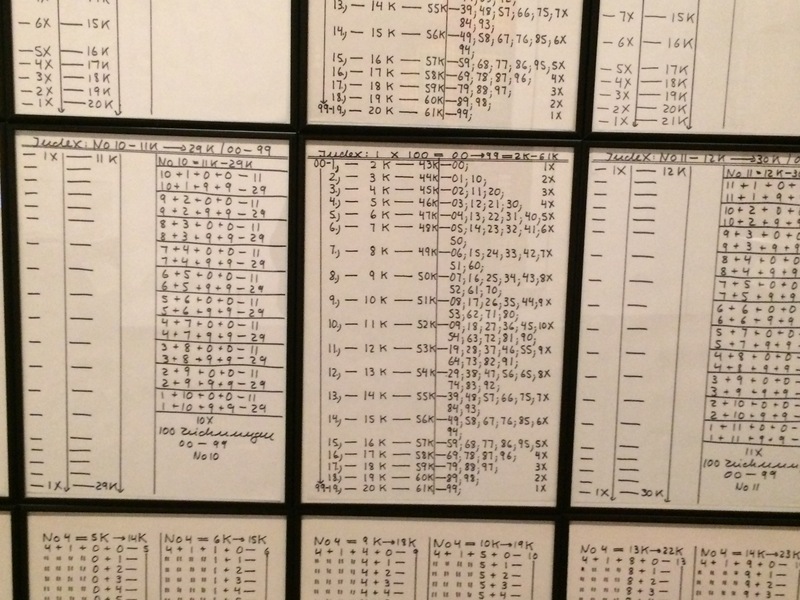 The MET Breuer’s current exhibition Delirious includes about two dozen art works that are related to Mathematics. 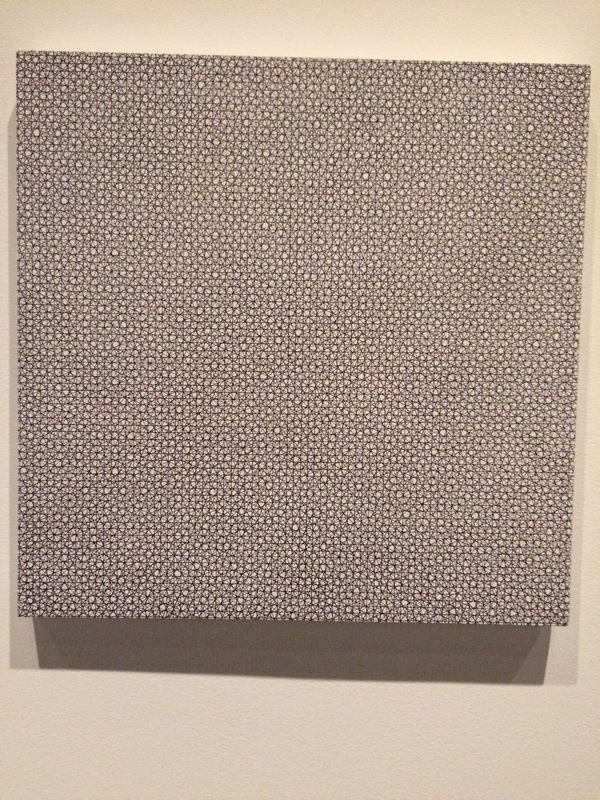 The Section of the show titled “Excess” features work that involves repetitive series. 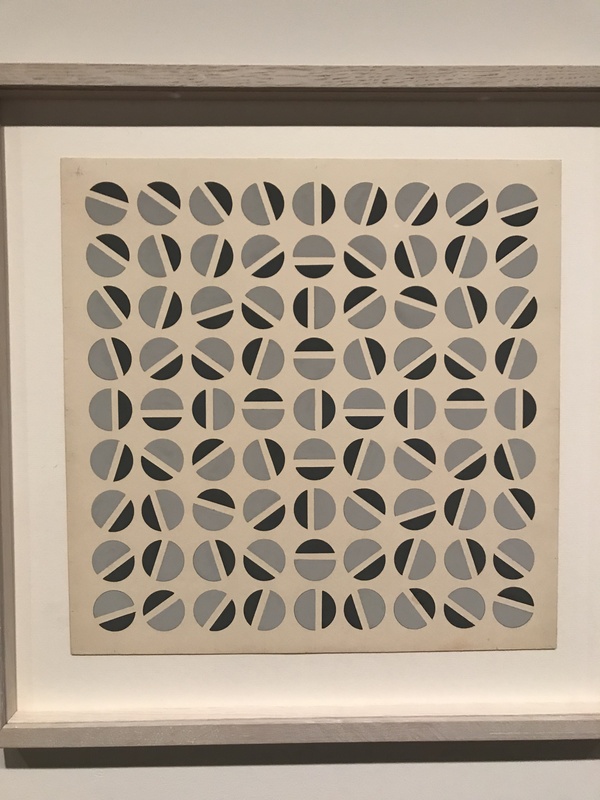 Here is Francois Morellet’s rule based painting “4 Grids 0° – 22.5° – 45° – 67.5°” from 1958. Morellet has layered a series of four square grids rotated by the prescribed number of degrees. 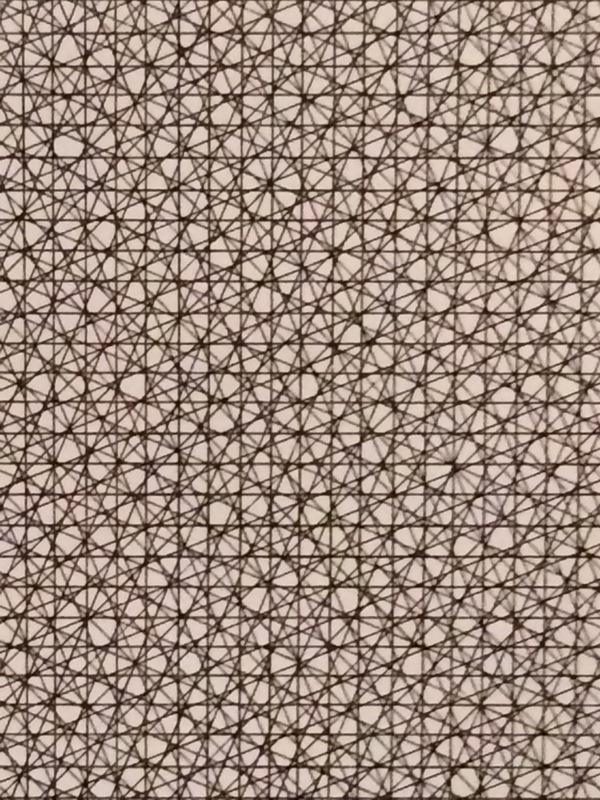 Like an interference pattern, the white sections pop in the intricate web of black lines. 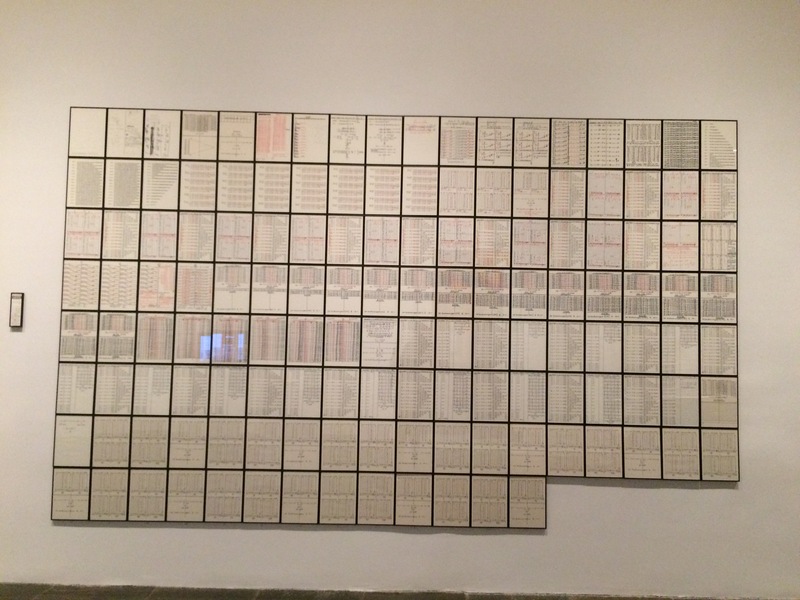 Darboven’s work involves the repetition of predetermined arithmetic operations. To me it functions as a type of visual number poetry. Delirious is really an amazing exhibit. I have only offered a brief sampling of the work on display. There is even a showcase with some of Sol Lewitt’s note books! If you are in NYC in the next few months I strongly recommend taking some time to have a look. If you can not make it to the museum, there are some images on their website and they have published a nice catalog. 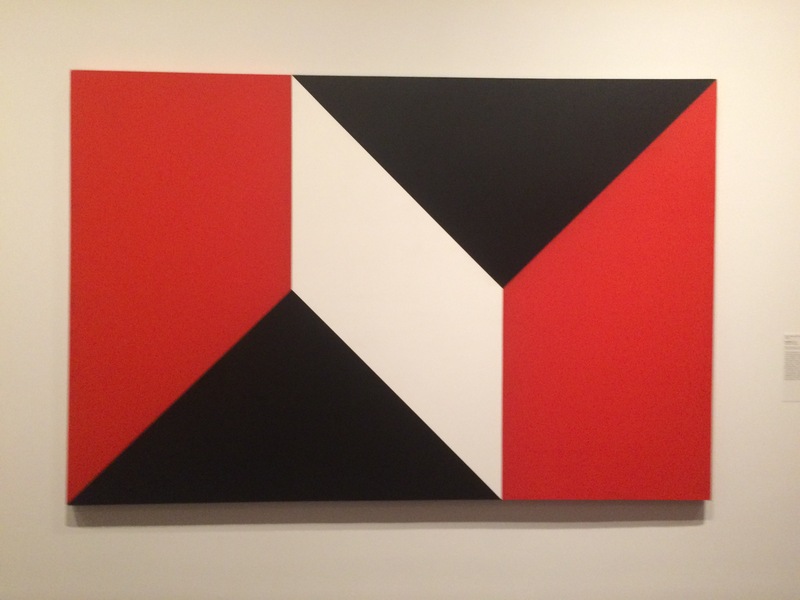 When I heard the title “Delirious” of the current exhibition at the MET Breuer I did not immediately think Math Art. This show explores art from the 1950-1980 period that was in reaction to the tumultuous time after WWII. It includes a broad range of styles and themes. Two sections in particular feature work with mathematical implications :”Vertigo” and “Excess”. The introductory wall signage even mentions the artists’ use of mathematics and geometry. One of the sections in the show is called “Vertigo”. Displayed in this area is work that warps the viewer’s perspective of space. 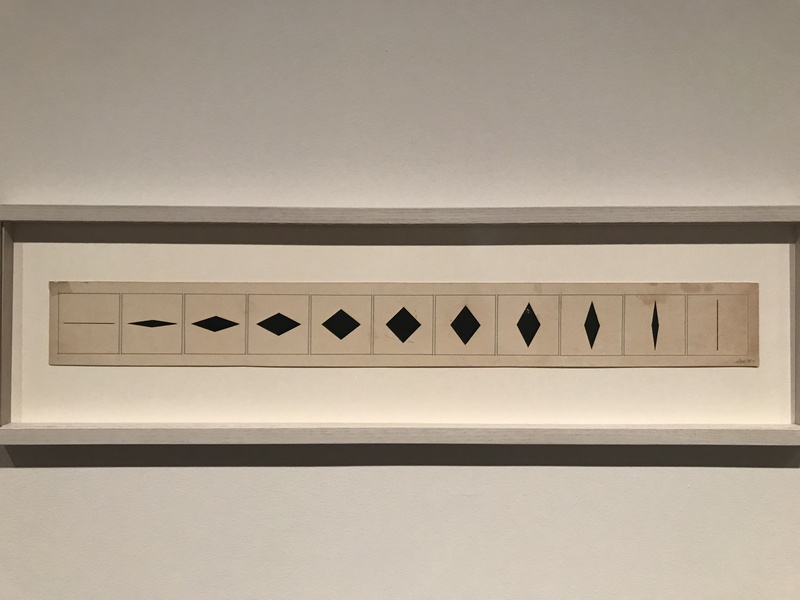 The 1965 painting “Snap Roll” by Dean Fleming uses flat isosceles triangles, trapezoids, and a single central parallelogram to produce the illusion of a 3-D form simultaneously pushing out of the plane of the canvas, and retreating into the same plane. This disorienting phenomenon disputes Euclidean Geometry. Robert Smithson’s Untitled (Model) from 1967 consists of a square grid of plastic panels. Carving away layers to reveal a diagonal step pattern, Smithson creates reflective symmetry. Although all of the ends of the elements retain their square shape along each column and row, the openings appear to stretch and warp. 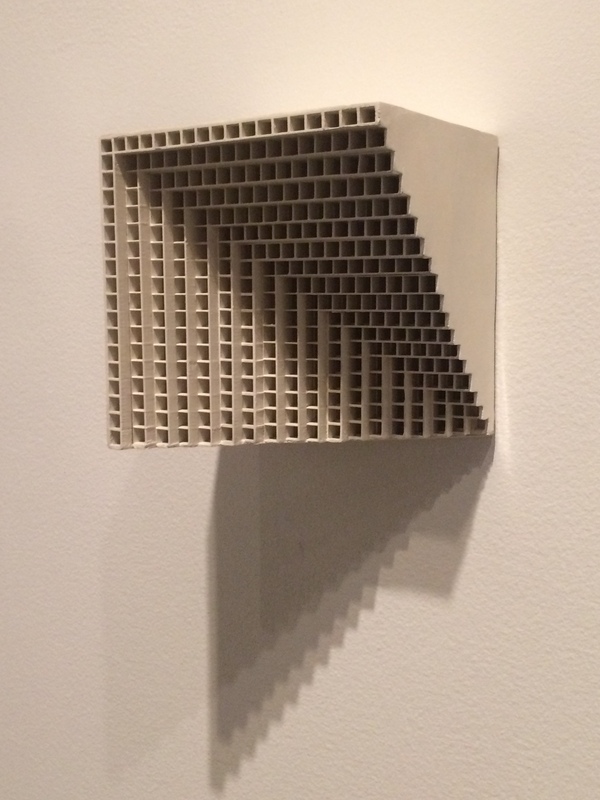 This sculpture questions the way space changes when we go from a 2-D flat plane into 3-D object. There were just so many wonderful examples of mathematically inspired art in this exhibit, it is hard to do it justice in a blog format. Next time I will write about the section titled “Excess”. This Spring the Metropolitan Museum of Art expanded its exhibition space into what used to be the Whitney Museum on Madison Avenue and is now called the “MET Breuer”. “Unfinished, Thoughts Left Visible” is one of the two of the inaugural shows. “Unfinished” features art which was never fully completed either by determination of the artist or by chance. On the forth floor of the museum there is a gallery with more abstract work that deals with the concept of infinity. The nature of the infinite creates a continuum in the work, thus alluding completion. One of best visual interpretations that I have seen of Zeno’s Arrow Paradox is in the form animated video. 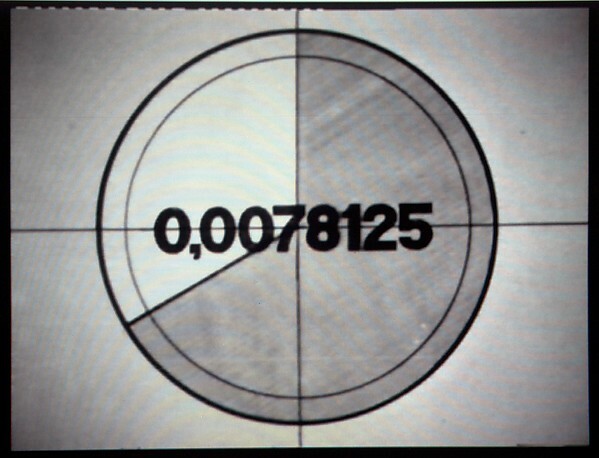 “La Flecha de Zenon” by Jorge Macchi and David Oubina begins the way many movies begin, with a count down of numerals from ten to one, but, when you think some other action will start after one, the numbers are divided in two and expressed as a decimal. As the numbers get smaller and smaller the length of the decimal gets longer and longer until the digits get so small they seem to disappear. We are left to believe they go on forever and zero is unattainable. Another artist in the exhibition that has a relationship with infinity is Roman Opalka. Beginning in 1965, he began a series of paintings on which he started to paint the numbers up to infinity. 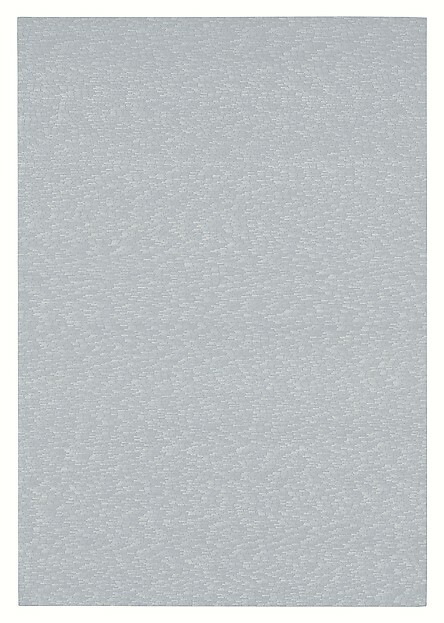 Each set of digits is hand painted in white on a grey background. The artist completed 233 canvases but of course never completed the project. These examples highlight the way numbers can be used as a tool to express themes of time and infinity and their effects on the human condition. Pictures courtesy of the Metropolitan Museum of Art.